In fact I saw them in the Brooklyn Costco in the second floor on January 11th. One asian man with 2 female compatriots handing out flyers; which was really weird to me. I've seen those flyers weeks before all around the city... The marketing ability of the show is impressive. You really do not see this in most broadway shows... especially one that will only run 9 days. Some search comes up sporadic mentions of the Falun Gong and it kinda makes sense because for a long time back I use to see groups protesting China's treatment of Falun Gong. However that's kinda silly and could be more China's propaganda machine. In the end I do not know. Anyone have more clues to this? Seems a mystery to me but maybe it's my imagination. I saw this show on the opening day (I was gifted tickets). There are 2 dances about falungong persecution, and 3 songs about spiritual enlightenment despite persecution, about taking down the red crooks. It's a good show, but not really a happy Chinese New Year jolly show. 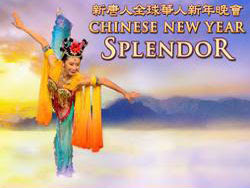 It is more poignant and the advertising is misleading by calling it a "Chinese New Year" splendor. I would go again as a regular autumn show, but NOT to celebrate Chinese New Year. It was not so feel-good of a show and too political. There is a lot of nice dancing but very spiritual in nature. Fifty years of lies have built this Red Wall. The values of honesty, kindness, and patience endure. Use the goodness within to weigh right and wrong. Then comes the chance of renewal. Heaven judges us, each and every one. While civility and decency go on, rejuvenated. May you be free of the confusion lies have wrought. And not go down together with the Red Crooks. In this knowledge lies the hope of deliverance. Sweet. Thanks Jenn. You are the best. This show is great. The production could not be better, especially with the live Orchestra. I feel peaceful and cheerful sitting in the theatre watching the whole show. The color is beautiful, beautiful, just like from the heaven. Although one or two shows touched Falungong topics, I feel nothing inappropriate since it simply tells the truth. The theme is well organized, presenting Chinese traditional virtue, multi-Chinese-nation's cultures, famous ancient stories. I enjoyed the whole show. It is a great experience. Will definitly come back next year.